The new 32-bit microcontrollers bring the promise of more speed and more performance while offering an unprecedented level of compatibility with existing 8 and 16-bit PIC microcontrollers. In sixteen engaging chapters, using a parallel track to his previous title dedicated to 16-bit programming, the author puts all these claims to test while offering a gradual introduction to the development and debugging of embedded control applications in C.
Author Lucio Di Jasio, a PIC and embedded control expert, offers unique insight into the new 32-bit architecture while developing a number of projects of growing complexity. 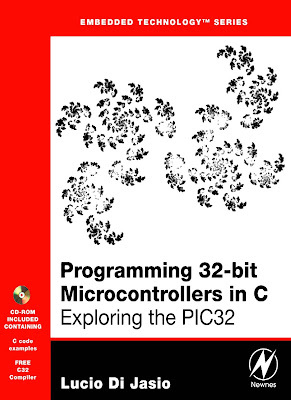 Experienced PIC users and newcomers to the field alike will benefit from the text's many thorough examples which demonstrate how to nimbly side-step common obstacles, solve real-world design problems efficiently and optimize code using the new PIC32 features and peripheral set. Los nuevos microcontroladores de 32 bits traer la promesa de más velocidad y más rendimiento a la vez que ofrece un nivel sin precedentes de compatibilidad con los actuales 8 y 16-bit de microcontroladores PIC. En dieciséis capítulos participación, utilizando una vía paralela a su anterior título dedicado a la programación de 16-bits, el autor pone todas estas reclamaciones para poner a prueba al tiempo que ofrece una introducción gradual para el desarrollo y la depuración de aplicaciones de control embebido en C.
Autor Lucio Di Jasio, un experto en control de PIC y embebido, ofrece una visión única de la nueva arquitectura de 32 bits, mientras que el desarrollo de una serie de proyectos de complejidad creciente. Los usuarios experimentados PIC y los recién llegados al campo se beneficiarán de muchos ejemplos a fondo del texto que muestran cómo esquivar ágilmente los obstáculos comunes, resolver problemas del mundo real del diseño eficiente y optimizar el código a utilizar las nuevas características y PIC32 conjunto de periféricos. Day 2: Walking in Circles. Day 3: Message in a Bottle. Day 10: Glass _ Bliss. Day 11: It ’ s an Analog World. Day 1: The Adventure Begins. The Plan. Preparation. The Adventure Begins. Compiling and Linking. The Linker Script. Building the First Project. Using the Simulator. Finding a Direction. The JTAG Port. Testing PORTB. Mission Debriefing. Notes for the Assembly Experts. Notes for the PIC MCU Experts. Notes for the C Experts. Tips & Tricks. Exercises. Books. Links. Day 2: Walking in Circles. The Plan. Preparation. The Exploration. While Loops. An Animated Simulation. Using the Logic Analyzer. Debriefing. Notes for the Assembly Experts. Notes for the 8-Bit PIC Microcontroller Experts. Notes for the 16-Bit PIC Microcontroller Experts. Notes for the C Experts. Notes for the MIPS Experts. Tips & Tricks. Notes on Using the Peripheral Libraries. Exercises. Books. Links. Day 3: Message in a Bottle. The Plan. Preparation. The Exploration. Do Loops. Variable Declarations. for Loops. More Loop Examples. Arrays. Sending a Message. Testing with the Logic Analyzer. Testing with the Explorer 16 Demonstration Board. Testing with the PIC32 Starter Kit. Debriefing. Notes for the Assembly Experts. Notes for the PIC Microcontroller Experts. Notes for the C Experts. Tips & Tricks. Exercises. Books. Links. Day 4: NUMBERS. The Plan. Preparation. The Exploration. On Optimizations (or Lack Thereof). Testing. Going long long. Integer Divisions. Floating Point. Measuring Performance. Debriefing. Notes for the Assembly Experts. Notes for the 8-Bit PIC® Microcontroller Experts. Notes for the 16-Bit PIC and dsPIC® Microcontroller Experts. Tips & Tricks. Exercises. Books. Links. Day 5: Interrupts. The Plan. Preparation. The Exploration. Interrupts and Exceptions. Sources of Interrupt. Interrupt Priorities. Interrupt Handlers Declaration. The Interrupt Management Library. Single Vector Interrupt Management. Managing Multiple Interrupts. Multivectored Interrupt Management. A Simple Application. The Secondary Oscillator. The Real-Time Clock Calendar (RTCC). Debriefing. Notes for the PIC Microcontroller Experts. Tips & Tricks. Exercises. Books. Links. Day 6: Memory. The Plan. Preparation. The Exploration. Memory Space Allocation. Looking at the MAP. Pointers. The Heap. The PIC32MX Bus. PIC32MX Memory Mapping. The Embedded-Control Memory Map. Debriefing. Notes for the C Experts. Notes for the Assembly Experts. Notes for the PIC Microcontroller Experts. Tips & Tricks. Exercises. Books. Links. Day 7: Running. The Plan. Preparation. The Exploration. Performance vs. Power Consumption. The Primary Oscillator Clock Chain. The Peripheral Bus Clock. Initial Device Configuration. Setting Configuration Bits in Code. Heavy Stuff. Ready, Set, Go!. Fine-Tuning the PIC32: Configuring Flash Wait States. Fine-Tuning the PIC32: Enabling the Instruction and Data Cache. Fine-Tuning the PIC32: Enabling the Instruction Pre-Fetch. Fine-Tuning the PIC32: Final Notes. Debriefing. Notes for the Assembly Experts. Notes for the PIC® Microcontroller Experts. Tips & Tricks. Exercises. Books. Links. Day 8: Communication .. The Plan. Preparation. The Exploration. Synchronous Serial Interfaces. Asynchronous Serial Interfaces. Parallel Interfaces. Synchronous Communication Using the SPI Modules. Testing the Read Status Register Command. Writing Data to the EEPROM. Reading the Memory Contents. A 32-bit Serial EEPROM Library. Testing the New SEE Library. Debriefing. Notes for the C Experts. Notes for the Explorer 16 Experts. Notes for the PIC24 Experts. Tips & Tricks. Exercises. Books. Links. Day 9: Asynchronous Communication .. The Plan. Preparation. The Exploration. UART Configuration. Sending and Receiving Data. Testing the Serial Communication Routines. Building a Simple Console Library. Testing a VT100 Terminal. The Serial Port as a Debugging Tool. The Matrix Project. Debriefing. Notes for the C Experts. Notes for the PIC® Microcontroller Experts. Tips & Tricks. Exercises. Books. Links. Day 10: Glass _ Bliss. The Plan. Preparation. The Exploration. HD44780 Controller Compatibility. The Parallel Master Port. Configuring the PMP for LCD Module Control. A Small Library of Functions to Access an LCD Display. Building an LCD Library and Using the PMP Library. Creating the include and lib Directories. Advanced LCD Control. Progress Bar Project. Debriefing. Notes for the PIC24 Experts. Tips & Tricks. Exercises. Books. Links. Day 11: It ’ s an Analog World. The Plan. Preparation. The Exploration. The First Conversion. Automating Sampling Timing. Developing a Demo. Creating Our Own Mini ADC Library. Fun and Games. Sensing Temperature. Debriefing. Notes for the PIC24 Experts. Tips & Tricks. Exercises. Books. Links. Day 12: Capturing User Inputs .. The Plan. Preparation. Buttons and Mechanical Switches. Button Input Packing. Button Inputs Debouncing. Rotary Encoders. Interrupt-Driven Rotary Encoder Input. Keyboards. PS/2 Physical Interface. The PS/2 Communication Protocol. Interfacing the PIC32 to the PS/2. Input Capture. Testing Using a Stimulus Scripts. The Simulator Profiler. Change Notification. Evaluating Cost. I/O Polling. Testing the I/O Polling Method. Cost and Efficiency Considerations. Keyboard Buffering. Key Code Decoding. Debriefing. Notes for the PIC24 Experts. Tips & Tricks. Exercises. Books. Links. Day 13: UTube. The Plan. Preparation. The Exploration. Generating the Composite Video Signal. The Output Compare Modules. Image Buffers. Serialization, DMA, and Synchronization. Completing a Video Library. Testing the Composite Video. Measuring Performance. Seeing the Dark Screen. Test Pattern. Plotting. A Starry Night. Line Drawing. Bresenham Algorithm. Plotting Math Functions. Two-Dimensional Function Visualization. Fractals. Text. Printing Text on Video. Text Test. The Matrix Reloaded. Debriefing. Notes for the PIC24 Experts. Tips & Tricks. Exercises. Books. Links. Day 14: Mass Storage. The Plan. Preparation. The Exploration. The Physical Interface. Interfacing to the Explorer 16 Board. Starting a New Project. Selecting the SPI Mode of Operation. Sending Commands in SPI Mode. Completing the SD Card Initialization. Reading Data from an SD/MMC Card. Writing Data to an SD/MMC Card. Testing the SD/MMC Interface. Debriefing. Tips & Tricks. Exercises. Books. Links. Day 15: File I/O. The Plan. Preparation. The Exploration. Sectors and Clusters. The File Allocation Table. The Root Directory. The Treasure Hunt. Opening a File. Reading Data from a File. Closing a File. The Fileio Module. Testing fopenM() and freadM(). Writing Data to a File. Closing a File, Take Two. Accessory Functions. Testing the Complete Fileio Module. Code Size. Debriefing. Tips & Tricks. Exercises. Books. Links. Day 16: Musica, Maestro!. The Plan. Preparation. The Exploration. OC PWM Mode. Testing the PWM as a D/A Converter. Producing Analog Waveforms. Reproducing Voice Messages. A Media Player. The WAVE File Format. The Play() Function. The Audio Routines. A Simple WAVE File Player. Debriefing. Tips & Tricks. Exercises. Books. Links. Disclaimer. Final Note for the Experts.